“He dragged me back – just in time. A tree had crashed down on to the side walk, just missing us. Poirot stared at it, pale and upset. Number One, a Chinese, the most clever criminal mastermind of all times, Number Two, a multimillionaire, Number Three, a beautiful French woman and Number Four, the “destroyer”, a ruthless killer, with a great talent for disguise, aims to get rid of those who stay in the way of their employer’s plans. Against them Hercule Poirot goes again along with his friend Hastings. Until now, the short detective was on only following one person, while now he has to split himself in four. Poirot and Hastings meet, but the two good old friends cannot enjoy their reunion because the work of the Belgian detective comes in the way. 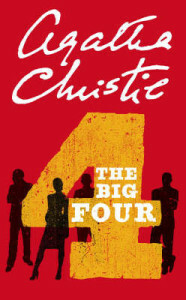 When they find out about the big four, they realize how dangerous they are only after somebody dies and the two, Hercule and Poirot notice that Number Four left some prints behind. They have to destroy this secret organization that threatens the whole world, but things get hard when one of them reveals that under those masks there are important people of the society hiding. With all of these out, Poirot and his friend get deeper into this mystery, with the wish of putting it to an end, even if dangerous. This is a very different novel, at least from almost all of Agatha Christie’s other novels. Here, she changed the tactic and started writing different detective/mystery novels. It was like you where reading four cases in one book. Now, the famous detective needs to figure out the biggest mystery of them all, a new, very big challenge. After believing that the case will remain unsolved, a solution came along. The book is very easy to read, making the reader almost not able to leave the book down. The book has a scent of Sherlock Holmes in it, coming out, for the first time, in 1927. It is clear that something unusual was going on with the expedition members that worked at the archaeological site of Hassanieh: the raise of tension, something about this beloved wife of Professor Leidner, the beautiful Louise. Louie’s afraid of something. Is this really just about panic attacks and hallucinations? “I’m afraid that I will be killed!” Leatherman confessed to his sister, who agreed to take care of him. Unfortunately, it turns out he was right. By coincidence, however, the greatest detective in the world was near: after disentangling the military scandal in Syria, Hercule Poirot begins to reach Hassanieh investigating the death of Louise. The book is about a murder that puts his skills to the test vs. the mystery with which the author already accustomed us with. 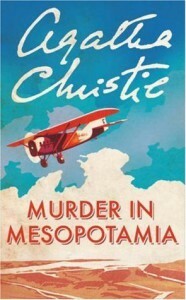 Murder in Mesopotamia is a detective novel written by Agatha Christie in 1936. You have always been one of the most loyal and benevolent of my readers and that is why I was seriously disturbed receiving criticism from you. You complained that my crimes became too refined – too boring, actually. 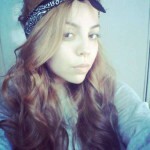 You told me that crave <a crime of that manner, so violent and bloody>. A murder that cannot be doubted by anyone, really! Here is the story you wanted, written especially for you. I hope you like it. In such a relationship, between Arthur Conan Doyle and Sherlock Holmes, her character, Christie became increasingly bored by Poirot’s character. In the late 1930s, Christie writes in the diary that she considers Poirot unbearable, being described as an egocentric maniac. Unlike Doyle, Christie resisted the urge to kill him as long as the character was still popular. During the Second World War Christie writes the novel “Cortina”, in Poirot’s last case, which is published at the end of the career of the author, describing it as the end of the character. Due to the popularity of the character, this is the only fictional character that had an obituary in the famous newspaper “The New York Times”, following the publication of the novel. 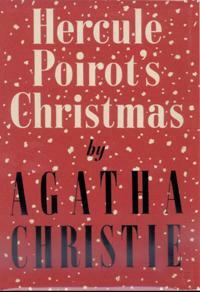 In “Hercule Poirot’s Christmas” chapters are divided into days, from December 22 until December 28. On December 22 Stephen Farr meets Estravados Pilar on a train, en route to England. The Lee family members receive letters from their father inviting them home for Christmas. On December 23 the members of the family reach the home of the tyrant millionaire. On December 24th, the Simenon family gathers in a conversation in his office while he was talking on the phone with his lawyer, deliberately, saying he wanted to change his will. After the discussion with the council, Simenon says all kinds of bad things about his children and his wife. The dinner that night was very tense, them each of them withdraws into it’s little corner. Suddenly noises come from Simenon Lee’s office. Things crashing, stuff falling and in the end an agonizing sound of a soul from hell. All rush to the door, the door is locked so that they can loon into a crack in which they see a bloody body, with too much blood around it, having it’s throat cut. That evening they started questioning what is going on. During the following days Poirot makes discoveries over discoveries, including that Stephen Farr died two years ago and that Stephen Farr’s someone else who’s in the house. He also discovers that Pilar died and that the one that poses as Pilar is Lopez’s Conchita. Having account of this all of this he soon realizes who the killer is.